The GolfBuddy Voice Golf GPS Range Finder is the first golf GPS that displays and also speaks the distances to you. It is also one of the smallest golf gps units available at only 1.7"x1.7" and weighs only 1 oz. It is so small that you can clip it on your visor and revert. No fees or subscriptions are necessary with the Golf Buddy Voice. Courses from around the world are already pre-loaded, so it is ready to use right out of the box. 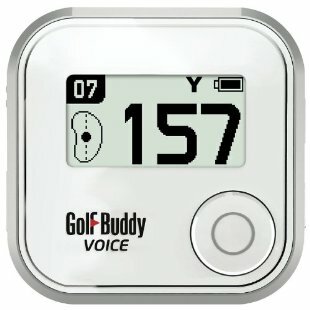 The GolfBuddy Voice displays and speaks the distances to you by just pressing a single button. The GolfBuddy Voice 2 GPS Unit features: With one click of a button, you can hear the distance to the front/center/back of the green. Multilingual (8 Languages) Automatic course and hole recognition. No need for a computer or subscription. just charge and play! (Rechargeable battery w/14-hour battery life) Preloaded with 38,000+ global courses. Includes Voice 2 GPS unit, USB charging cable, and quick start instructions. GolfBuddy Voice GPS Range Finder Golf Buddy w / Auto Course + Hole Recognition -- Why Buy Elsewhere? We Have Over 105,000 Positives! Store: OverTheRidge Condition: New (Open Box, or other) Price: $79.99 Total Price: $79.99 Buy It from OverTheRidge No returns. Store: premium_golf_outlet Condition: Brand New Price: $83.99 Total Price: $83.99 Buy It from premium_golf_outlet No returns. NEW GolfBuddy Voice 2 Golf GPS Audio Distance Range Finder - Choose Color! GolfBuddy Voice X Handheld Golf GPS Rangefinder Buddy Black White VoiceX NEW!